In this blog, everything is about ajummas because this blog is for ajummas and I really want to share who ajummas are to both Koreans who already knew about ajummas and others who never heard about ajummas before. 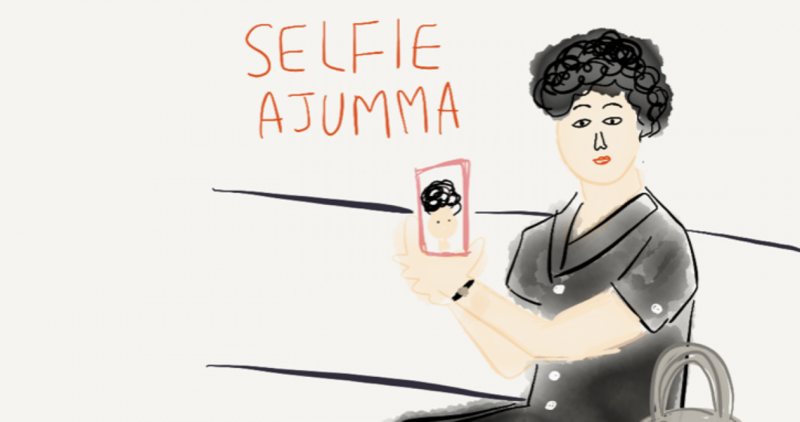 In the previous blog postings, I wrote mostly about ajummas who were in pre-smartphone era (times when ajummas didn’t use smartphones, from early-1960s to early-2000s). Now I will talk more about ‘Smart Ajummas’ because that is my biggest concern why I do this blogging and I would like to share ideas and information how Korean ajummas are becoming ‘Smart Ajummas’ and what these ‘Smart Ajummas’ are doing in their everyday lives with the use of smartphones. Anyway, today I’ll talk about ‘Ajumma Day’ in Korea. Actually I had no idea what ‘Ajumma Day’ was before I’ve been there in 2014. Ajumma day was established in 2000 by one of the biggest website for ajummas azoomma.com and now many of ajummas in Korea love Ajumma day on the 31st May in every year. May is for family month in Korea for example, 5th is Children’s day, 8th is Parents’ day and 15th is Teacher’s day. And the reason why they chose the last day of May as Ajumma day is because Ajummas (mothers at home) are the most important people in every family so they chose the 31st of May (family month). As an ajumma in the digital information age of the 21st century, I pledge that I will endeavour to do my best as an independent being for myself, my family as well as the social changing and progress. I am an independent ajumma who loves myself and recognise the value of my life. I love myself the way I am now and I am proud of myself as an ajumma. I do my best to find the right to live happily as a woman. I am a leader ajumma who takes care of my family and lead the healthy family culture creation. I do my best for family life that a wife and a husband loves, understands and helps each other. Ajumma, as the pillar of the family, I practice from the small thing to create the healthy family culture. I’m a active ajumma who recognise my role in the digital information age and challenge to the new world through the Internet. As a principal agent of home information, I endeavour to do my best to inform my children. I actively embrace new technology and try to use it according to social change and progress. For the research, I went to Ajumma day in 2014 and I was really impressed. I was more than happy that there is a special day only for ajummas in Korea. And the programs for that day were fully enjoyable and at the same time they gave very useful information for ajummas. Most of all, I think this ajumma day encourages ajummas to be proud of themselves through various actives on that day. Also these ajummas can have opportunities to meet other ajummas who are in the same boat. So ajummas can become one big ajumma group through ajumma day or any other various events for ajummas. Posted on 31 Jan 2016 31 Jan 2016 by moon ajummaPosted in Smart Ajumma (English)Tagged ajumma, ajumma day, Ajumma manifesto, 아줌마, 아줌마 화이팅, 한국여성, Korea, Korean women, smart ajumma.